Plastic welding is the process of making a molecular bond between two thermoplastics that are compatible, which when cooled return to a solid form. One straight forward process for doing this is ultrasonic plastic welding. Whatever the specifics of a particular application, ultrasonic welding's fundamentals always remain the same, employing sound waves that are ultra-high in frequency, plastic can be heated with the ensuing friction, creating a strong bond. Ultrasonic welding is very precise. It can be applied to working with many different kinds of plastic. Materials are bonded with no need for adhesives or external heat being applied. A small quantity of localised heat is generated by the procedure but the equipment actually relies on sound waves to achieve the weld. There are several advantages to ultrasonic welding: High rates of production and consistent results can be achieved time and again, and the bonding mechanisms can be computer controlled ensuring that full monitoring capabilities of the welding process can be monitored. It also enables high degrees of integration in an automated system making quality control is much easier. Users also find that ultrasonic welding equipment is the most cost effective way of welding for many linear components. In the majority of cases, a standard bench mounted machine is suitable with just a change of tooling necessary for different welding jobs. Start with two plastic components. Insert these into the location nest or an anvil to hold them firmly in place, if the parts are free to move during welding then you could loose amplitude creating a variable and poor quality weld. A horn or sonotrode is then applied using pneumatic force to the components. Meanwhile, a wave of ultra-high frequency sound is created with the help of an ultrasonic stack. In general this comprises of three parts: the sonotrode, a transducer, and a booster. When the weld has been completed, the cooling phase begins with the stack momentarily remaining on the parts while force is applied to the cooling parts. This phase should only take one second or even less. 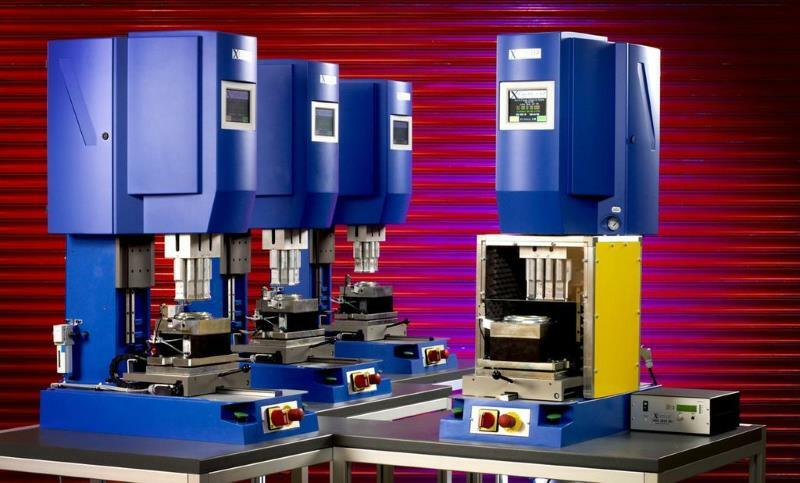 The potential of ultrasonic welding systems is vast. Easy to control sound waves mean that repeating welds is easy plus the process is extremely fast. From start to finish plastics can be successfully welded in seconds. With no adhesive needed, costs are cut. In many instances prefabricated sonotrodes are available which will be suitable for the component you are welding, but custom ultrasonic tools can be made to your specifications by our experienced engineers. Regardless of the application, when you are bonding plastic parts, it's highly likely ultrasonic welding will be your kind of technology. Once an ultrasonic welding system is set up, only basic checks on a routine basis are required to maintain everything in good order. The mechanics are comparatively simple, and the parts are durable and strong. Ultrasonic energy is very consistent because it's controlled by a microprocessor. Fumes are rarely created. As a result, special precautions for respiration are not required. With some forms of ultrasonic welding hearing protection is recommended, as standard all of our machines are supplied with an acoustically lined guard for the operators and third party safety. At Xfurth we manufacture a range of ultrasonic welding machines both standard and special purpose for all types of application. To find out more, please download our free Ultimate Guide To Ultrasonic Welding by clicking here. For all other questions, please get in touch with one of our team by calling 01582 436000.